Adding lights, flash or strobes to your underwater camera has never been this easy, whether Sea Dragon lighting or almost any other manufacturer, Flex-Connect has you covered with a turn-key mounting solution. Further expand your camera set with Flex-Connect accessories – add grips, flex arms, trays and more with just a “click”. Flex-Connect allows you to transform your camera set from compact to full-featured in just seconds, providing a quick way to adjust to any diving environment. Check out the Flex-Connect Mounting Guide for a detailed chart of the fitting and application. Mount a flash or light and add stability to your ultra compact underwater camera. Quickly and easily add grips, lights, flashes and Flex Arms to the Micro Tray with just a “click!” and remove them with the push of a button. Mounts to all cameras with a standard 1/4-20 tripod mount and includes mounting knob. 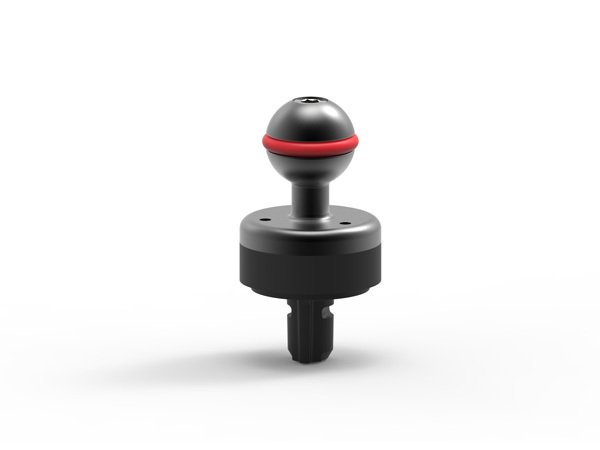 The Flex-Connect 1-inch Ball Clamp connects two 1-inch (25.4mm) diameter balls together. The aluminum clamp plates are spring-loaded for easy assembly and breakdown. Its wing-nut handle features an attractive red anodized finish. The rubber-armored grip “clicks” directly into any Flex-Connect tray and accepts all Flex-Connect accessories and Sea Dragon Lights & Flash heads. Complete with Flex-Connect Single Tray, Grip, Flex Arm and Y-S Adapter, this kit will help you get the most out of your underwater camera. Just add nearly any brand of camera and light, and you’re ready to head into the water. The tray uses a standard ¼-20 tripod mount to fit most major brands of underwater cameras, and the Y-S adapter and Flex-Connect mounts attach to a wide array of underwater lighting brands. Complete with Flex-Connect Dual Tray, two Grips, two Flex Arms and two Y-S Adapters, this kit will help you get the most out of your underwater camera. Just add nearly any brand of camera and lights, and you’re ready to head into the water. The tray uses a standard ¼-20 tripod mount to fit most major brands of underwater cameras, and the Y-S adapter and Flex-Connect mounts attach to a wide array of underwater lighting brands. The Flex-Connect YS Adapter easily connects any underwater light or flash using a YS mount to Flex-Connect grips, trays, arms, cold shoe mount, and other accessories – with no need to worry about compatibility issues. The YS Adapter rotates on its base left and right, and has up and down directional control by angling the light on the mount. neck and included hex-wrench. The installation to the Flex-Connect adapter should take no more than 10 minutes and requires no other tools.